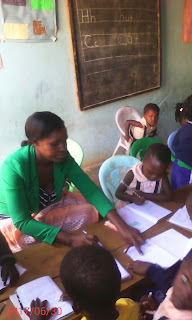 This is Bridget's new teacher, Olivia, helping pupils in class at the Crane Academy for Infants in Uganda. Several years ago Bridget started her own nursery school in the house of her sister in Kampala. It has grown and now has three or four classrooms. Many schools in Uganda are private schools as the government has failed to keep up with the increasing population and the gap is filled by the private sector. Bridget has been extremely enterprising to get her school to grow as it has. Bridget was at Lutengo school with Harriet and was the second female student supported by the Guildford Mukono Link through university. Bridget writes: "Crane academy infant school is fine. We are getting our holidays tomorrow on Friday. And next term will begin on 18th September 2017. Next term will be short but we shall have many activities to do. Like graduating pupils from top class to primary, sports day and completing the syllabus."